Prepare to be jealous, perpetual to-do-listers of the world: because it shuts down only one side of its brain at a time, the dolphin never needs to sleep. Dolphins don't even seem to slow down. When researchers tried their hardest to wear out a dolphin by it making it do the same echolocation task nonstop, the experiment came to an end—15 days later—before the dolphin's attention flagged. Although dolphins (as far as we know) don't have checklists, they do have a couple very good reasons not to doze off. One is sharks. By staying attentive at all times, dolphin pods can prevent predators from gaining the element of surprise. Another reason is breathing. Like other mammals, dolphins are stuck with the task of periodically inhaling air. Constantly coming to the surface to breathe doesn't leave much room for rest. Their solution is to sleep, literally, with one eye open. 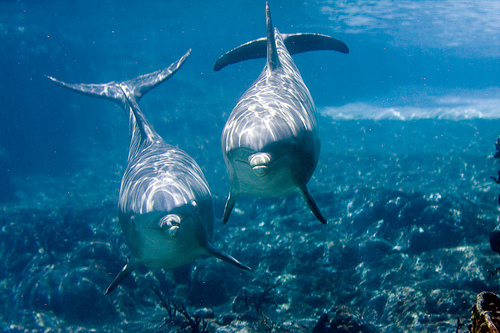 Along with other marine mammals and migrating birds, dolphin conk out with one side of their brain—and close one eye—while the other side stays wide awake. In an earlier study, researchers showed that dolphins could pay attention to a task for five straight days without seeming to get tired. Now, they set out to push the animals even farther and see what happened. Brian Branstetter of the National Marine Mammal Foundation in San Diego and other scientists conducted their experiments on two dolphins, a 26-year-old male and a 30-year-old female. Both dolphins had participated in at least one study on this subject before, so they knew the drill. For each experimental trial, a dolphin stayed within a 20-by-20-foot floating pen, enclosed by nets, in San Diego Bay. Around the pen's perimeter were eight underwater microphones. The dolphin's task was to constantly patrol the enclosure, sending out echolocating clicks at each station. If it heard its sonar signals echo back (something that would normally indicate another animal was out there swimming around, but in this case was merely a computer-generated phantom), the dolphin had to press a paddle. For performing the task accurately, the dolphins got fish snacks. When tested for five straight days, both dolphins continued to patrol the pen and press the paddle accurately the whole time. (They may have wondered, though, why trainers were willing to stick around and keep tossing them fish.) Both animals lasted through three separate five-day trials. They began to perform a little worse by the fifth day, although this effect had shrunk by the third trial. So although the dolphins may have gotten tired or bored with the experiment, they seemed to adjust to the schedule as they went on. Out of the two dolphins, the female was the star performer at this task. She was both more accurate and, according to the researchers, more eager to participate, making "victory squeals" when she got the right answers. So she alone moved on to the next round of the study. This was originally planned as a 30-day marathon of clicks, paddle pushing, and fish tossing. But a winter storm rolled into the bay after 15 days and forced the team to cut it short. Throughout the 15 days, the female dolphin continued to perform her task with near-perfect accuracy. The experiments were set up so that the number of computer-generated targets varied somewhat depending on the dolphins' performance. In this case, the female dolphin was challenged with almost 80 imaginary sonar targets every day, or more than 3 an hour on average. That doesn't even leave room for a cat nap. But even at the end of the 15 days she showed no signs of slowing down. "How much longer she could have performed the task," the authors write, "is unknown." Dolphin mothers with newborns have been observed swimming without rest for two months or more. To keep their babies fed and protected from predators, mothers remain alert and vigilant for as long as it takes. It seems like a cruel joke that the ability to stay sharp for weeks, or months, without resting belongs to an animal that doesn't know what a deadline is. They can work or play for as long as they feel like, a skill we humans only have in our dreams.